A record 201 National Olympic Committees (NOCs) participated in the Olympic Games. The overall tally for events on the programme was 301 (one more than at the Sydney Games in 2000). Popularity in the Games also soared, as 3.9 billion people had access to the television coverage compared to 3.6 billion for Sydney. This global audience enjoyed coverage of never-before seen sports such as women's wrestling, which was included in the programme for the first time. Swimmer Michael Phelps won six gold medals and set a single-Games record with eight total medals. Leontien Ziljaard-van Moorsel became the first female cyclist to earn four career gold medals, reaching a total of six Olympic medals, while canoeist Birgit Fischer became the first athlete in any sport to win two medals in each of five Olympic Games. Runner Hicham El Guerrouj won both the 1500m and the 5000m, while on the women's side Kelly Holmes triumphed in both the 800m and the 1500m. In team play, Argentina won the men's football tournament without conceding a goal, and the US softball team outscored their opponents by an aggregate score of 51-1. 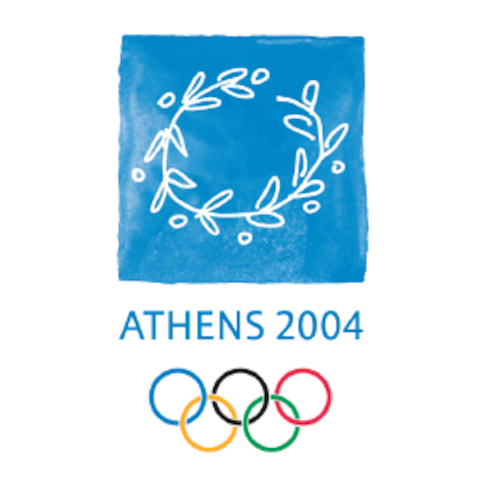 The 2004 Olympic Games emblem is a wreath made from an olive tree branch, or kotinos. The emblem is a reference to the ancient Olympic Games, where the kotinos was the official award of Olympic champions. Nikolaos Kaklamanakis, Olympic participant in sailing (1992, 1996, 2000, 2004, 2008), gold medallist in Atlanta 1996 and silver medallist in Athens in 2004. The selection criteria for the torchbearers was based on choosing people who played an important role in their communities through sport, education and culture, who inspired others and who embodied the values of the Olympic Games and the ideals of the Olympic Movement. 6,600 km in Greece of which 2,500 km was on foot, 2,800 km by convoy and 1,300 km by helicopter. 78,000 km by land, sea and air for the international relay. Greece, Australia, Japan, Republic of Korea, People’s Republic of China, India, Egypt, South Africa, Brazil, Mexico, United States, Canada, Belgium, Netherlands, Switzerland, France, United Kingdom, Spain, Italy, Germany, Sweden, Finland, Russia, Ukraine, Turkey, Bulgaria, Cyprus. Phevos and Athena. The names of the two mascots are a reference to two gods of Olympus: “Phoebos” is another name for Apollo, the god of light and music; “Athena” is the goddess of wisdom and protector of the city of Athens. The two mascots thus symbolise the link between Ancient Greece and the Olympic Games of the modern era. Phevos and Athena are brother and sister. They owe their strange shape to a typical terracotta doll in the shape of a bell from the 7th century BC, the “daidala”. They symbolise the pleasure of playing and the values of Olympism. The choice of a brother and sister was deliberate: they embody the unity of men and women, through equality and brotherhood. Phevos wears a blue tunic to recall the sea and the colour of the Games emblem, while Athena is in orange to evoke the sun and the Paralympic emblem. In Ancient Greece, as well as being children‟s toys, daidala had a symbolic function. Before they got married, girls would sacrifice their doll and their dress to the gods for purity and fertility. The example which inspired the mascots is displayed at the National Archaeological Museum in Athens. A competition was held to design the mascot. In all, 196 proposals were submitted by design agencies and professionals from all over the world.